Clinical Psychologist/Kai-mātai Hinengaro for the Waitematā District Health Board (DHB), with Whītiki Maurea Māori Adult Mental Health and Addictions Service. 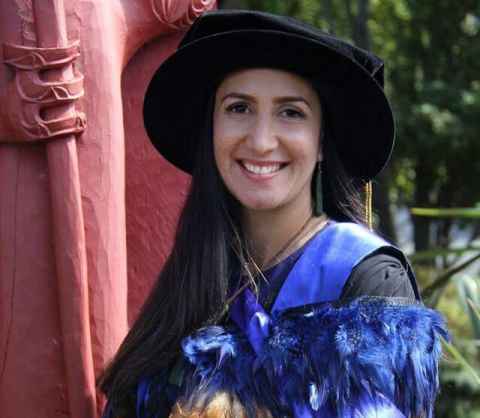 An important aspect of my career path has been the interface between mātauranga Māori science and western science. I grew up in Kōhanga Reo and Kura Kaupapa Māori and have been brought up with a Māori worldview so being able to understand western science has added to my kete. I work alongside a team of nurses, social workers, occupational therapists, psychiatrists and taurawhiri (cultural advisors) in order to support adults facing mental health difficulties. A key strength of the service is that we have 10 taurawhiri (cultural advisors) and kaumātua and kuia. We also run Hōtaka Hauora Groups, so tāngata whaiora (service users) get to experience whanaungatanga and to connect with others in a Māori environment. Our tāngata whaiora (service users) learn skills and positive coping strategies to alleviate their mental health difficulties from within our own Māori paradigms of health. Outside of work my main role is being a mother to three active boys aged 15, 8 and 5. I spend a lot of time with my whānau, my parents and my sisters and their tamariki who live nearby. I also spend a lot of time with my whānau at Te Kōhanga Reo o Te Rongomau and Te Kura Kaupapa Māori o Ngā Maungarongo in central Auckland as my children attend there and parents both work there as well. I feel lucky to have another whānau living in Auckland and often go back to the Hokianga to replenish and rejuvenate. It’s important to have a space and place for us to be Māori and feel connected.